Here is this week's edition of Tough Call. 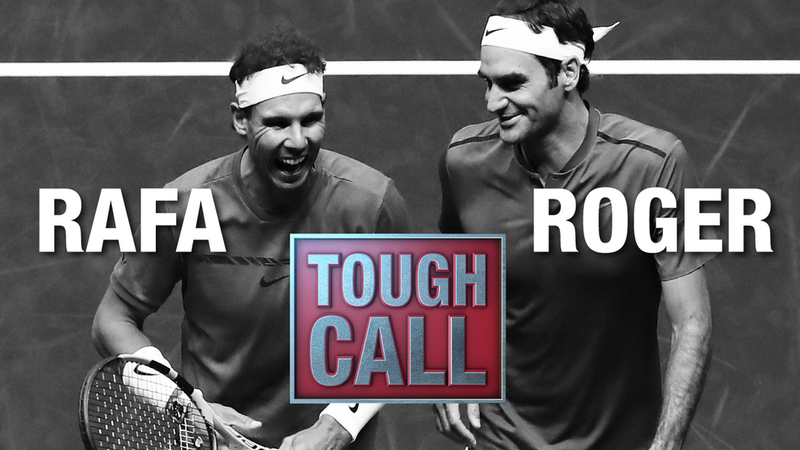 Who will win ATP Player of the Year - Federer or Nadal? ~ He not only won two of the four Grand Slams this year - the Australian Open and Wimbledon - but he only played three of them, so he went two for three. ~ He often plays some of his best tennis during the fall indoor season and if he’s able to make up the points deficit on Nadal and take year-end No.1, that tips the scales. ~ Whereas Nadal obviously leads their career head-to-head, Federer has dominated Nadal this year, winning all three of their meetings (including their last two in straight sets). ~ If he can win the ATP Finals in November, which is generally considered the fifth-biggest tournament on the calendar, it could serve as a 2017 tie-breaker with Nadal. ~ He not only won two of the four Grand Slams this year - the French Open and US Open - but he also made a third final at the Australian Open. Federer didn’t make a third final. ~ He’s won more titles AND more matches than Federer this year (for titles it’s only six to five, but for matches it’s by a long way - it was 61 to 39 going into Shanghai). ~ He’s currently on track for year-end No.1, and if he can clinch it, that tips the scales. ~ If he can win the ATP Finals in November, which is generally considered the fifth-biggest tournament on the calendar, it could serve as a 2017 tie-breaker with Federer. In my view, Nadal will get the nod over Federer for Player of the Year. They split the four major titles, but as long as Nadal is ranked No. 1 in the world at the end of the season, he would deserve to be regarded as Player of the Year. He is the only man to appear in three finals at the Grand Slam events in 2017. He has played a more ambitious schedule than Federer. The way I see it now, Player of the Year goes to the Spaniard despite a spectacular campaign from Federer which includes three wins without a defeat against Nadal. Both these legends had a surprisingly brilliant year, splitting the four Slams evenly. Federer’s three victories over Nadal and his Sunshine Double win almost assures him the win. However, I think Nadal had a lot at stake as he completed his historic Triple La Decima - Monte Carlo Open, Barcelona Open, and Roland Garros. He has also extended his lead over Federer in the race for year-end No. 1 with his win in Beijing. You can't compare Roger's and Rafa's careers—the edge goes to Federer, by the numbers—without considering Nadal's head-to-head superiority. And you can't compare Roger's and Rafa's 2017 seasons—the edge goes to Nadal, by the numbers—without considering Federer's head-to-head superiority. The Spaniard will likely finish the year as No. 1, but Federer should win ATP Player of the Year for his similar accomplishments (two Slams, two Masters) and 3-0 mark against his rival. The Spaniard has been remarkable this season, winning two Grand Slams and six titles. While Federer is right there with him, this award should go to the man that played more matches—especially considering how consistently he was winning them. It's Rafa. The award could obviously go to either of them this time, but since it's traditionally given to the player who finishes the year No. 1, that will most likely be Rafa at the moment. He has a solid lead in the rankings race, and is in the midst of the most consistent season of his career. While both Nadal and Federer won two Slams this year, Nadal has played a lot more matches, earning the No. 1 ranking by what is becoming an insurmountable lead of over 2,000 points. Yes, Federer's win percentage is 0.91 while Nadal is 0.87, but Nadal has won six titles and 61 matches to Federer's five titles and 39 matches (going into Shanghai). The only thing Nadal needs to do to unequivocally secure the Player of the Year nod is beat Federer this season (he's 0-3).